I met Annie a few weeks ago when she was signing prints at a store. Before I even saw Annie I was awestruck by her magnificent work! It drew me in. And then her work became even more beautiful as I visited with Annie and felt her genuine, tender heart as she spoke. "My silver strands are the people in my life - my parents, family and friends - these are my angels in difficult times, and a lot of my art is dedicated to them. I look back on my life with a real amazement for the teachers that were placed in my path. I was raised with a professional artist for a dad and he taught me to paint and draw when I was really little. I also was able to work as an art assistant for J. Kirk Richards, who gave me a lot of inspiration and encouraged me to do religious art. These incredible mentors and many great teachers have been a huge blessing toward helping me to create art today." "Traveling abroad to Europe - particularly England and Italy - was a huge inspiration, and has deeply influenced my work. I basically left my heart in Italy - and it was while I was living in Florence for a month I started making religious art, which I fell in love with. I loved the contrast of these beautiful old walls that had been around for hundreds of years, and yet were surrounded by modern life. I wanted to create art that was that balance of antiquity and freshness - art that people can relate to in any age and yet will not look dated. My art is also really influenced by spiritual experiences I had while serving as a missionary in England for my church. I met people there that yearned for relief from trials, and wanted more hope and a greater purpose to life. I met people there who were spiritual, faithful people despite exreme hardships, and people who were the closest I have seen to being true angels and saints on earth for their great love for others and God. These two experiences culminated in the art I make now. When I looked at the pieces of art Annie was selling, I wondered how she could ever part with one of her originals! From Annie: "There have been several paintings that have been really hard to part with - usually these paintings are at points where I made a breakthrough or realized something in the creation of a painting. I've had several paintings where the idea and composition of the painting came to me in a beauitful way, in a dream or as a sort of epiphany. The hardest painting for me to part with was "Streams of Mercy", mostly because I felt that I had created an image that had a depth of emotion I had not been able to create before. Annie is providing a large autographed print of the above image, "Tender Mercies" on artistic watercolor paper, valued at $64.99. And (to prove what a sweet heart Annie has) she will ship ANYWHERE ... which means all of you wonderful over-seas bloggers: you're in on this giveaway!! Winner will be randomly drawn and announced on Thursday, October 20th. GOOD LUCK friends! I'm so excited for all of you!! I am a follower and you were correct on your Facebook link saying this is the giveaway to enter! Her paintings are amazing! "The Widow's Mite (all that she had)" struck a chord with me because she is holding her baby and giving the last of her money at the same time. I posted this link to the giveaway on Facebook. I tweeted about this awesome giveaway. Undoubtedly Annie Henrie is a great artist. Impressive paintings. I love her work it's simply beautiful. Classic, timeless and peaceful. My favorite would have to be "Balm of Gilead" because it's the most desired places to find oneself humbling but overwhelmingly wonderful. Wow! Beautiful art, beautiful heart! Great art creates emotion. This lovely piece definitely achieves that! Please enter me in this give away! Sweeet, tender paintings. Annie has a beautiful spirit to create art which carries such love and emotion. YES! I want to be entered into the give-away! “Congratulations” my friend....You have reached 300 followers, how awesome!! Thank you for visiting and commenting on my blog, Wow what a lovely and kind hearted giveaway you are offering with such beautiful art. I would love to enter thank you so much. I hope you have a wonderful day. Wow great pieces! I am a follower! I went to her website and I like Streams of Mercy because its such a tender and peaceful picture. Oh, what a great giveaway!!!! I really like the Heralding Angels!!!!! I am a new follower of Silver Strands! I went to Annie's website and am totally awed by her talent. My favorite one (for today anyway) is The Widow's Mite! AND I also emailed 3 people telling them this is a must see! I think her art is beautiful! wow! her work is gorgeous! i love streams of mercy! She's amazingly talented! Would love to win! Beautiful art by an artist with a beautiful heart. Just lovely. I love them all but "Widow's Mite" is my personal favorite...brought a little tear to my eye. Amazing! I am happy to be introduced to her art. What a beautifully talented woman this Annie is! I love that the giveaway piece is called Tender Mercies. When I was on my mission we would look extra hard for the tender mercies in our lives each day. I'm a Silver Strands follower. I just saw Annie's work for the first time, in LDS LIVING. My heart is also in Italy, so her paintings really speak to me. If I have to choose just one that is my favorite, I guess it is "Balm of Gilead." I adore Annie's works of art. Gorgeous and so very meaningful. I would give this to my mother. 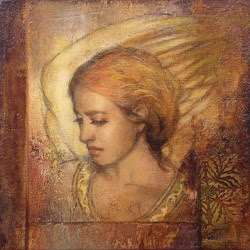 Being the eldest of eight and raised Catholic, I can see there is so much love infused in her art. Oh and I am a follower of course!! I am happy to see a comment or two from some of my friends that I alerted to your blog and this amazing give-away! Ohh! And I forwarded your link to 9 more friends today! Today my 'favorite' is Tender Mercies! They are all lovely. Such beautiful paintings. Love the giveaway painting. It's hard to pick my favorite painting. "All is Well" is beautiful. I would really love to win this giveaway! If I do I will give Tender Mercies to our daughter who was widowed at the age of 32, with a 7 year old daughter and a 6 onth old son. The painting seems to be her and the help from heaven with her little family.